Chicago/New York | Reuters — Hurricane Irma sent farmers and food companies scrambling to protect processing facilities, farm fields and animal herds in the south and southeastern parts of the U.S. on Wednesday. Florida sugar and citrus processors rushed to secure rail cars and equipment that could be crushed, blocked or turned into flying projectiles. Cattlemen opened up their fences and moved animals to higher ground and wooded areas, which can offer some relief from high winds. To the north, cotton farmers in North and South Carolina fretted their fields might be facing a fate similar to their Texas counterparts. Late last month, Hurricane Harvey, which became a tropical storm after making landfall in Texas, destroyed an estimated $150 million worth of cotton, ripping the bolls off plants and leaving white fiber strewn across fields (all figures US$). At U.S. Sugar, a Clewiston, Florida-based sugar producer that farms, mills and refines sugar, staff are drawing down water levels in farm canals, securing processing facilities and making plans for post-storm cleanup, company spokeswoman Judy Sanchez said. “There’s not a thing we can do about the cane fields and orange groves, but pray,” said Adam H. Putnam, commissioner of the Florida Department of Agriculture and Consumer Services. One particularly keen concern for the sugar industry: How badly can the hurricane damage the sugar cane fields, as harvest is set to begin on Oct. 1? Worries about Hurricane Irma hitting growing regions in the Caribbean and Florida helped boost raw sugar futures on the Intercontinental Exchange on Wednesday. Orange concentrate futures for November delivery also jumped Wednesday to $1.499 per pound, the highest since early May. Florida sugar cane accounts for nearly a quarter of sugar produced in the U.S., according to the U.S. Department of Agriculture. The hurricane also could potentially impact sugar prices through oil and ethanol prices, said James Liddiard, analyst at Agrilion Commodity Advisors in New York. Sugar prices often track energy prices as petroleum is a key input cost and millers can divert cane to sugar or ethanol. State officials in Florida called for evacuations ahead of the storm’s expected landfall there this weekend, as the potentially catastrophic hurricane slammed through Caribbean islands with pounding winds, rain and surging surf. 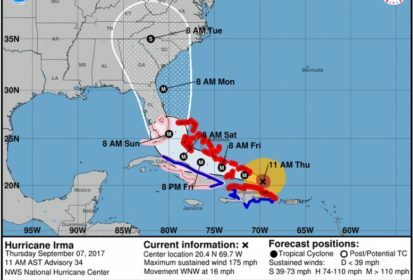 Hurricane Irma is expected to impact the U.S. along the eastern coast of Florida, according to the National Weather Service, before moving on to Georgia, South Carolina and North Carolina — states known for cotton, grain and livestock production. The biggest risk the North Carolina cotton crops faces is wind, which would blow cotton plants over, said Guy Collins, a cotton extension associate professor and specialist at North Carolina State University in Raleigh. Heavy rain too could push the cotton bolls to the wet ground and cause rot. North and South Carolina represent about five per cent of cotton acres planted this year, according to U.S. Department of Agriculture data. Storm prep led livestock operators in North Carolina, the country’s second-largest producer of hogs and turkeys, to stock their grain bins with extra feed, in case the roads washed out. Smithfield Foods, the world’s largest hog producer and processor owned by Hong Kong-based WH Group, was closely monitoring pits holding liquid hog waste, said company spokeswoman Kathleen Kirkham. At Prestage Farms, staff are testing backup generators and making sure there is ample fuel to keep them running. They are also preparing to shutter the company’s turkey processing plant in St. Paul, N.C. if the storm turns dangerous to that area. — Reporting for Reuters by P.J. Huffstutter in Chicago and Renita D. Young in New York; additional reporting by Theopolis Waters in Chicago.